City of Chicago has multiple technology tools that you can use to connect residents to the city. Robust open data can inform you of recent activity anywhere in the city, whether it is crime, licenses, or arriving buses. Some of our APIs also let you communicate to city officials, such as the Open311 API that lets you open service requests or the ClearPath API that lets users submit tips or see upcoming community meetings. This page connects you to the documentation to help developers create tools for their neighbors. Track the city buses, trains, advisories, and scheduled stops. See documentation on Chicago Transit Authority's Train Tracker, Bus Tracker, customer alerts and scheduled stops (GTFS) at CTA's Developer Center. Develop applications that can open and close 311 requests for services in the city ranging from filling potholes to fixing broken streetlights. Over a dozen services can be requested using the API that follows the Open311 API specification used by a dozen other cities. Chicago's Open Data Portal contains 600 data sets ranging from crimes to beach water quality. The portal is hosted by Socrata, which has a robust API to quickly retrieve and query data. The Socrata Open Data API (SODA) documentation provides a great overview of the API with plenty of examples and SDK's for a handful of popular programming languages. DIVVY bikeshare program is the largest in the world. This API endpoint provides the availability of bicycles at each DIVVY station across the city. It is updated every minute and great for those who want to build a DIVVY app. Historical DIVVY bike availability and bicycle trips are available on the Open Data Portal. A set of beta APIs that allows developers to build applications that can submit anonymous tips, display mugshots, list the most wanted individuals, and a list of community events where you can meet your local community police captain. Maintained by the Chicago Police Department. Visit the City of Chicago's GitHub page to see over a dozen open source projects maintained by the city. Many of sites and tools are used by residents every day and often used by other cities or researchers. You don't only help your city, but you also help your neighbors and other people. 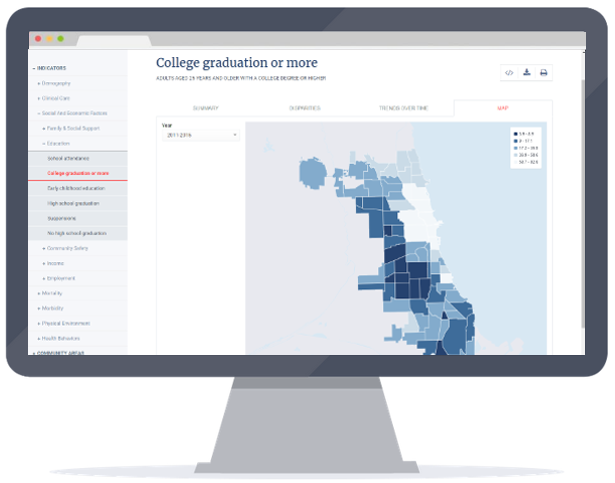 Chicago Health Atlas let's the public review, explore and compare health-related data over time and across communities. It displays over 160 health and health-related indicators provided by the city, non-profits, state, and federal data. Take a look at the existing issues for ideas or suggest your own.